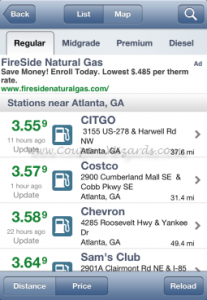 Find the cheapest gas on the go – for free! 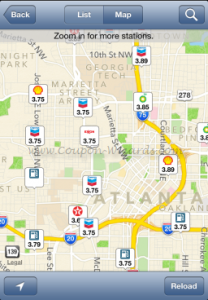 Locate gas stations near you and see their current gas prices. For every gas price reported, you’ll earn points towards our prize give-away. GasBuddy is a community of users working together to update gas prices. 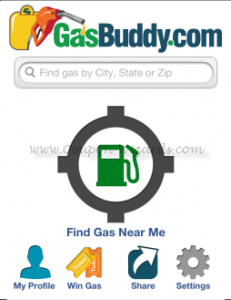 The GasBuddy App is available on all major smartphone devices. GasBuddy has saved us several times while driving. It would be one price at one exit, but then at the very next exit gas would be $0.20 cheaper per gallon. Multiply that over 16 gallons and that’s pretty good savings. On their website they have several other interesting features like the Gas Price Heat Map, or a Trip Calculator. With these tools you should be able to forecast a pretty accurate budget for even the most complicated of road trips. The focus of this app though is the ability to see the price of gas near you to help you make an informed decision on where you stop. For an app like this to work it has to have the participation from its community to help keep the prices updated.